A designer’s D.C. home is filled with creative solutions to practical problems. Necessity is to creative types as a basketball court is to Michael Jordan, both a challenge and the ultimate inspiration. Slam-dunk interior design wouldn't spring to life without it-certainly not the intelligently hard-working, uniquely good-looking kind that graces the new home of Washington, D.C., designer Skip Sroka. "When we were building our house, we decided we didn't want separate living and family rooms but one big living room where we would spend time," says Skip. "We didn't want to debate, should we have drinks in this room or that one." Yet that's where agreement ended. Skip and fashion executive John Kammeier, though partners for 23 years, had disparate visions of how their living room should function. John wanted it equipped with a TV and a bar; Skip, not so much. "I don't mind TVs and bars in a family room, but not in the living room," the designer says. His challenge was to somehow unify and gratify their opposing needs without compromising either one. "I created something that made us both happy," he reveals. His creative solution is an exquisitely paneled pale wood wall that opens to reveal a fully stocked bar. When the bar is closed, only beautiful, seamless paneling is on view. When the panels are thrown open-party time! "It's my favorite design in the house," Skip admits. "Kind of baroque-meets-21st century." He conceived the design by first studying the exteriors of structures built in English baroque style. "I noticed, especially at the exterior front doors, they did these very intricate patterns in stone. I decided to translate stone to wood for a contemporary adaptation. I came up with a pattern and did the geometry so it would make sense in a white-lacquered, two-dimensional design." To grant John's request for functionality and at the same time honor his own aesthetic, Skip also concealed a flat-panel TV behind the large gilt-frame mirror above the living room fireplace. But hang on. These are just the beginning of his inventive solutions to practical problems. In the library-shown above-Skip played more hide-and-seek with two built-in desks that pull out from chair-rail moldings and concealed file drawers that pop out from the wainscoting. Both units are symmetrically positioned on either side of a pair of big French doors leading from the foyer. "We each wanted a place to work, but we didn't want to have a mess to clean up every time the doorbell rang," explains Skip. Drawing from his background in industrial design, he "planned the library wall grid to within 1/16th of an inch," he explains. "I like grids-I think that 20 years from now, they will still stand the test of time." 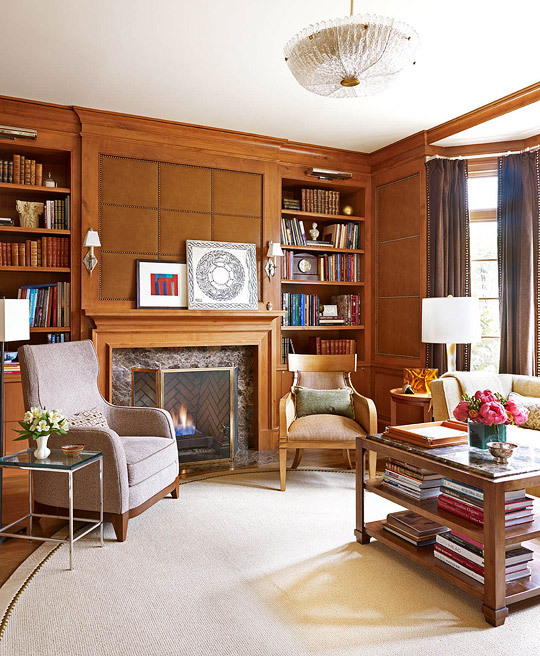 Tweaking the traditional concept of a wood-paneled library, he chose faux leather instead of wood as the primary wall material, which he then fashioned into a grid. "I knew I didn't want a typical wood-paneled library. I wanted to make it more tactile. I have no idea where I get my ideas. This one probably resulted from a project I had just completed for clients, using mohair inserts in wood paneling and then adding matching mohair draperies." A kindred backdrop for leather books, the faux leather imparts warmth essential for a library, but its plumped-up padding also adds a cushion of comfort that goes beyond the norm. And while raising the room's warmth, the inventive wall grid also ups the cool factor. Nailheads neatly trim each square of the grid, reinforcing the precision of the geometry. "I didn't want the nailheads to become overly decorative," notes Skip, "so I avoided any kind of swirling pattern that would draw attention to them. I believe it's better to tear a design down a little bit and get to its essence, especially with backgrounds." Elsewhere in the home, Skip ingeniously hid electronics and small appliances or fit them so glove-tight into shelves they appear to have sprouted organically. A microwave disappears into a kitchen cabinet; a TV in the kitchen fits between shelves so snugly only 1/8 inch of air hovers in between. Another TV is behind a hinged painting in the master bath's bookcase, allowing viewing from the tub. Even the foyer is not what it appears: "An entire panel pops open that houses all of the AV (audio-visual) stuff," observes Skip. It's not brain surgery, he insists, though his solutions do require a cooperation of left and right lobes, as they are equal parts inspiration and math. "Can you tell my background is industrial design?" he laughs as he talks about the painstaking geometrical precision of his creations. "But, basically, I just think there are a lot of practical things we use in our lives that we need to hide. That's what I've done here." Interior design: Skip Sroka, CID, ASID, Sroka Design Inc., 7307 MacArthur Blvd., Suite 214, Bethesda, MD 20816; 301/263-9100, srokadesign.com. Architect: Anne Decker, Anne Decker Architects, 5019 Wilson Lane, 2nd Floor, Bethesda, MD 20814; 301/652-0106, annedeckerarchitects.com. Builder: Gibson Builders, 5185 MacArthur Blvd. N.W., Suite 210, Washington, DC 20016; 202/364-1555, gibsonbuilders.com. Mantel (designed by Skip Sroka): Sroka Design, 301/263-9100, srokadesign.com. Fireplace screen: Decorative Crafts, 800/431-4455, decorativecrafts.com. Available through Sroka Design, 301/263-9100, srokadesign.com. Chair left of mantel ("Washu Chair" #PB9930, by Powell & Bonnell): Dennis Miller Assoc., 212/684-0070, dennismiller.com. Glass-top end table: Sroka Design, 301/263-9100, srokadesign.com. Floor lamp (by Visual Comfort): Circa Lighting, 877/762-2323, circalighting.com. Chair to right of mantel: BSG, Buying Service Group Inc., 301/263-9300, buy4designers.com. Skip gave the library verve by using faux leather rather than wood for paneling. The coffee table is his own design, as is the lamp on the right. The delightful mod klismos chair is by Donghia. Sofa ("Ariel Series" #6884): R. Jones & Assoc., 214/951-0091, rjones.com. Sofa fabric (discontinued): Arc-Com Fabrics Inc., 800/223-5466, arc-com.com. Pillows: Clarence House, 800/803-2850, clarencehouse.com. Coffee table (custom, by Skip Sroka): Sroka Design, 301/263-9100, srokadesign.com. Chair at left of sofa: BSG, Buying Service Group Inc., 301/263-9300, buy4designers.com. End table left of sofa: Eric Brand, 650/259-0207, ericbrand.com. Lamp on end table (discontinued): Donghia, 914/662-2377, donghia.com. Art on end table (from Prague, Czechoslovakia): owner's collection. End table to right of sofa: Global Views, 888/956-0030, golobalviews.com. Lamp on end table: Sroka Design, 301/263-9100, srokadesign.com. Drapery ("Lavish"/Chocolate #26837-6); drapery trim ("Soho Braid"/Subway #TA5361-6): Kravet, 888/457-2838, kravet.com. Woodwork (designed by Skip Sroka): fabricated by Metropolitan Woodworking, 301/322-3417, metropolitanwoodworking.com. Wall upholstery (designed by Skip Sroka): fabricated by Al Soussan, Custom Furniture & Wall Upholstery, 301/216-1520, wallsupholstered.com. Light fixture (vintage Orrefors, by Quotient); area rug (custom): Sroka Design, 301/263-9100, srokadesign.com. Chair at right ("Anziano Chair" #90002): Donghia, 914/662-2377, donghia.com. A built-in desk is one of a pair in the library that pull out from the chair rail on either side of the doorway to the foyer. File drawers are concealed in the wainscoting. A beguiling mix in the entry hall includes an antique mirror, bookends from the Metropolitan Museum of Art Shop, and chairs from Target. Chest; pair of vases: Sroka Design, 301/263-9100, srokadesign.com. Pair of chairs: Target, target.com. Flower holder: Niermann Weeks, 212/319-7979, niermannweeks.com. Small bookends: Metropolitan Museum of Art Shop, 800/468-7386, store.metmuseum.org. Paint ("Print Room Yellow" #69): Farrow & Ball, 888/511-1121, farrow-ball.com. A warm neutral wall covering by Schumacher sets the stage for relaxation in the living room. Skip designed the area rug; the coffee table is by Salvations Architectural Furnishings. Wall covering ("Fidenza Ground"/Natural #528940): Schumacher, 800/523-1200, fschumacher.com. Upholstered sofa; blue pillows on sofa: owner's collection. Gold-patterned pillows on sofa: Brunschwig & Fils, 800/538-1880, brunschwig.com. Coffee table ("Greek Key Coffee Table" #CT10): Salvations Architectural Furnishings, 301/445-1400, salvationsaf.com. Bowl on coffee table (blue with gold); footed bowl (antique); box (antique); pair of chairs (antique); right end table (antique): owner's collection. Left end table: La Barge Inc., 336/812-2420, labargeinc.com. Table lamps: Grant Antiques, 301/215-9292, grantantiques.com. Drapery (cream linen): Norbar Fabrics, 800/645-8501, norbarfabrics.com. Drapery trim (Tweeded Braid"/Camel #TA5214-16): Kravet, 888/457-2838, kravet.com. Shade fabric ("Ravenna Embroidery"/Bone #64742): Schumacher, 800/523-1200, fschumacher.com. Area rug (custom): Sroka Design, 301/263-9100, srokadesign.com. Art behind sofa (by David Shapiro): Bill Lowe Gallery, 404/352-8114. lowegallery.com. The handsome wood-trimmed chair to the left of the living room fireplace is by BSG; on the table beside it, an urn lamp by Sirmos nods to classicism. Antique sconces flank a mirror that conceals a flat-panel TV. Mantel (designed by Skip Sroka): fabricated by Concrete Jungle, 301/874-1001, concretejungleonline.com. Lounge chair; pillow on lounge chair; floor lamp: owner's collection. Chair to left of mantel: BSG, Buying Service Group Inc., 301/263-9300, buy4designers.com. Round table (antique); chair to right of round table (antique): owner's collection. Urn lamp (Siramos); rug (custom): through Sroka Design, 301/263-9100, srokadesign.com. Daybed; pillow on daybed: owner's collection. Armoire/bar cabinet (designed by Skip Sroka): Sroka Design, 301/263-9100, srokadesign.com. Skip's ingenious solution to avoiding the off-putting look of a bar in the living room: Now you see it . . .
. . . now you don't. The beautiful paneling conceals the bar when it's not in use. "I think there are a lot of practical things we use in our lives that we need to hide," Skip says. "That's what I've done here." A find from Paris, the dining room's colorful chandelier illuminates Limoges dinnerware and a mirror from Friedman Brothers Decorative Arts. The wall covering is by Paul Montgomery Studio. Wall covering: Paul Montgomery Studio, 540/337-6600, paulmontgomery.com. Chairs: BSG Inc., Buying Service Group Inc., 301/263-9300, buy4designers.com. Buffet (Lucien Rollin Collection): William Switzer & Assoc., 212/207-8332, lucienrollin.com. Mirror ("The Cottingham Park" #6804, Traditional Collection): Friedman Brothers Decorative Arts, 800/327-1065, friedmanmirrors.com. Chandelier (from Paris): owner's collection. Blue-and-white urn on pedestal; blue vase on table; chargers (Limoges); dinnerware (Limoges); salad plates (vintage) owner's collection. Napkin rings (discontinued): Dransfield & Ross, 212/741-7278, dransfieldandross.biz. Yellow glassware: antique. Crystal candlesticks: Tiffany & Co., tiffany.com. The light and airy kitchen features Wood-Mode cabinetry and Electrolux appliances. Cabinetry: Wood-Mode, 877/635-7500, wood-mode.com. Cooktop: Electrolux, 877/435-3287, electroluxappliances.com. Hood: Vent-a-Hood, 800/331-2492, ventahood.com. Countertop: Durango marble. Crisp white shelving with a blue-painted interior showcases Skip's McCoy pottery collection. Wall paint ("Harbor Haze" #2136-60); ceiling paint ("Hollingsworth Green" #HC-141): Benjamin Moore & Co., 888/236-6667, benjaminmoore.com. Table ("Dakota Glass Dining Table"): Julian Chichester, 336/886-2454, julianchichester.co.uk. Chair fabric ("Shira"/Citron #P9080): Pindler & Pindler, 805/531-9090, pindler.com. Chair trim (2-inch Flat Tape #7242-84): Duralee Fabrics, 800/275-3872, duralee.com. Pottery collection (McCoy pottery): owner's collection. Green glassware: Crate & Barrel, 800/996-9960, crateandbarrel.com. Soft blues and greens envelop the guest bedroom in serenity. Linens on the inviting bed are by Frette, and the classic lamps are by Visual Comfort. The night tables and armoire are antiques. Bed (custom, by Skip Sroka): Sroka Design, 301/263-9100, srokadesign.com. Bed linens: Frette, 212/299-0400, frette.com. Decorative pillow on bed: owner's collection. Table lamps (by Visual Comfort): Circa Lighting, 877/762-2323, circalighting.com. Art over bed: owner's collection. Carpet: Godfrey Hirst, 800/480-7134, godfreyhirst.com. Mural panels: Kay Jones, 310/347-7877, kayjonesmurals.com. Wall color ("Simply White" #OC-117); ceiling color ("Whispering Spring" #2136-70): Benjamin Moore & Co., 888/236-6667, benjaminmoore.com. The striped chair is part of the designer's personal collection. A TV is hidden behind a painting that's positioned in front of the bookshelves in this serene, understated bath. The classic fixtures are by Kohler. Tub; fixtures ("Pinstripe"): Kohler, 800/456-4537, kohler.com. Tub surround: Wood-Mode, 877/635-7500, wood-mode.com. Blinds: Hunter Douglas, 800/789-0331, hunterdouglas.com. Trim and ceiling paint ("Mink" #2112-10): Benjamin Moore & Co., 888/236-6667, benjaminmoore.com. Flooring: Crema Marfil with Emperador Brown. Skip designed the ottoman in his restful bedroom, where the focal point is a striking fireplace with tile by Michael Berman through Walker Zanger. Bed linens are by Frette, and the strié wall finish is by Monkton Studios. The round mirror is an antique. Bed: Sroka Design, 301/263-9100, srokadesign.com. Headboard fabric: leather. Bed linens: Frette, 212/299-0400, frette.com. Upholstered bench; art over bed; night table; table lamp: owner's collection. Fireplace tile ("Marquis Octagon & Rectangle," Studio Moderne Collection by Michael Berman): Walker Zanger, walkerzanger.com. Wall finish (strié): Monkton Studios, 410/343-0238, monktonstudios.com. Pair of chairs: Beachley, out of business. Pillows on lounge chairs: Brunschwig & Fils, 800/538-1880, brunschwig.com. Ottoman (custom): Sroka Design, 301/263-9100, srokadesign.com. Ottoman fabric: Brunschwig & Fils, 800/538-1880, brunschwig.com. Designer Skip Sroka's traditional new home. Skip Sroka with sweet-faced Lucky, a papillon-sheltie-corgi mix. See a dozen design tips from Skip Sroka.